The plugin does not offer any configuration options on Plugin Settings screen. The plugin adds a new Visual Editor button. You can use the Visual Editor button to configure each Gallery. Below is the screen shot of Visual Editor Button along with option description. Enter the ID of Video you want to add in the Gallery. If you are not sure how to get the ID of videos on different platform then please visit the common questions section. You can have 6 videos per Gallery which I think is sufficient. But in case you need more then plugin can be customized as per your need. Note using too many videos on a page may significantly impact page load time which is not good for optimal user experience. 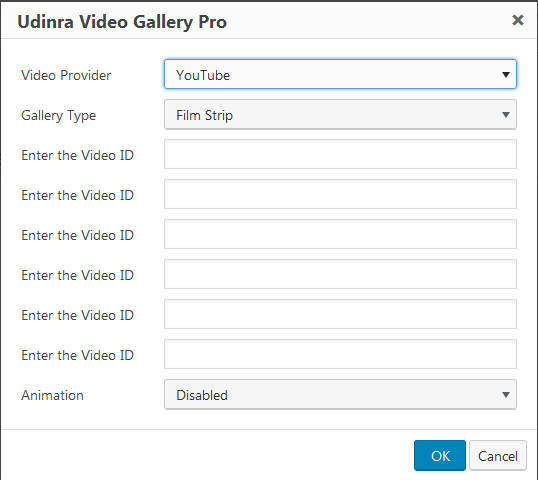 In case you do not know how to get Video ID of a particular video then read this article. If you select Random animation mode then you will have different animations to different videos or video thumbnails.